OTTAWA—Ticked-off Canadians, irked by U.S. metals tariffs and President Trump’s harsh words for their prime minister, are boycotting American products and buying Canadian. But the 58-year-old, who called the tariffs from Canada’s close trading partner a “slap in the face,” said he has in recent weeks put more Canadian products into his shopping cart. Calgary resident Tracy Martell, meanwhile, replaced her Betty Crocker brownie mix with a homemade recipe and hasn’t visited the U.S. since shortly after President Trump’s inauguration. Beth Mouratidis, who lives in Barrie, Ontario, is trying out Strub’s pickles as a replacement for her longtime favorite, Bick’s. The push to buy more Canadian products—and to boycott American ones—gained strength after the U.S. levied 25% tariffs on Canadian steel and 10% on aluminum starting June 1 and President Trump called Canadian Prime Minister Justin Trudeau “Very dishonest & weak”on Twitter following a Group of Seven meeting the following week. Canada in turn imposed retaliatory tariffs on some U.S. products, including foodstuffs such as ketchup, orange juice and yogurt. But Canadians’ efforts to buy more local products often run into a conundrum. What’s really Canadian? The country is the U.S.’s top export market, taking a little more than 18% of all U.S. goods that are sold abroad. Sylvain Charlebois, a professor in food distribution and policy at Dalhousie University in Nova Scotia, estimates roughly 40% to 60% of food on Canada’s grocery shelves is from the U.S. Closely linked production chains make it tough to determine how much of any given item was produced domestically. “I’ll swear up and down something is 100% Canadian,” said Ms. Mouratidis, who curates a Facebook list of Canadian household goods, food products and other items. Ms. Mouratidis said she was convinced Old Dutch chips were all-Canadian until she found out Old Dutch Foods Ltd. is a subsidiary. The parent company, Old Dutch Foods Inc., is based in Minnesota. The snack food is still on Ms. Mouratidis’s list, she said, because the Canadian company makes its chips in Canada. Susan Quinn-Mullins, a semiretired communications professional from Burlington, Ontario, said she turned to the frozen-food section of her local grocery store when she couldn’t find Canadian-grown sweet potatoes. Canadian food giant McCain Foods Ltd. makes sweet-potato fries, but the package said the potatoes were grown in the U.S., Ms. Quinn-Mullins said. “I’m now becoming slightly radical about this,” said Ms. Quinn-Mullins, who skipped the fries and is still on the hunt for Canadian sweet potatoes. A spokeswoman for McCain said its sweet potatoes are sourced from the U.S., where the climate is better for growing them. Enthusiasts have occasionally drawn fire in their efforts to elevate Canadian brands. A social-media post promoting Kawartha Dairy over “American” Haagen-Dazs ice cream was criticized by a Facebook user who pointed out that Haagen-Dazs products sold in Canada are made at a Canadian plant. The plant also uses Canadian dairy, Nestlé Canada Inc. confirmed. Another product could be getting a boost from the “Buy Canadian” push: Hawkins Cheezies, a corn snack that looks like a denser and crunchier version of Cheetos that is made with Canadian cheddar. W.T. Hawkins Ltd., which makes the snack, said two large grocery-store chains recently increased their orders. Others have found themselves in the crosshairs of Buy Canadian supporters. Kraft Heinz Co. has been a frequent target for Canadians since Heinz stopped producing ketchup in Ontario in 2014. A list circulating online recently that ranked consumers’ best options for Canadian products puts French’s ketchup ahead of Heinz because it is manufactured in Canada. 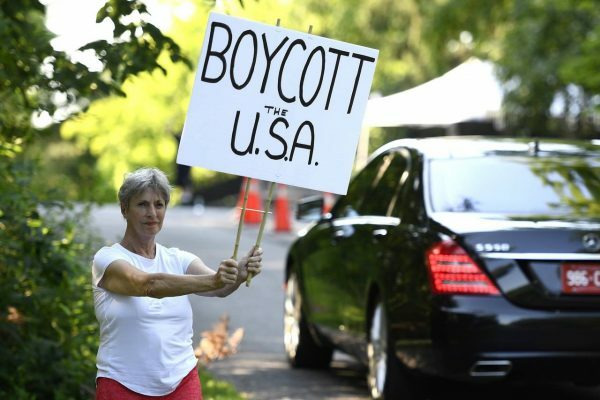 It is difficult to say whether the nascent boycott efforts are having an impact. Goods exports to Canada were up nearly 4% in June from the same month last year, according to the U.S. Census Bureau. However, they were down 1.2% when compared with the previous month on a seasonally adjusted basis. One sector where the boycott efforts doesn’t seem to be working is travel. Overall cross-border car trips by Canadians were up 12.7% in June from the same month last year, according to Statistics Canada.